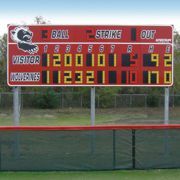 Impress the fans and the competition with this popular Varsity Scoreboards VSBX-742LED. This 20-foot by 8-foot scoreboard features large 24-inch super-bright 100,000-hour-rated LED displays, which are the largest in the industry and are easily seen from every seat in your stadium. 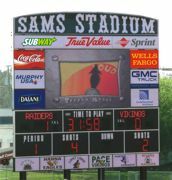 Your team name or mascot can be reproduced in the middle of the scoreboard to add even more impact. Increase advertising revenue, excite the crowd during the big game and promote upcoming events with a complete scoring system from Nevco. Superior resolution and full matrix design provide enhanced text and graphics capabilities. Display text, logos, moving messages and corporate advertising. For more than 70 years, Nevco has provided athletic and recreation facilities with high-quality scoring and display products. This focus on quality, service and reliability is the cornerstone of Nevco's success. When the game travels, you need an LED scoreboard that travels with you. 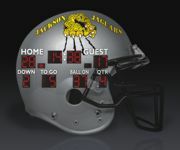 Fair-Play features a series of electronic portable scoreboards that easily pack up and go wherever the game takes you. Whether it's scoring football, baseball, wrestling or any other sport, Fair-Play has the answer. Outdoor models feature wheels and a handle for easy mobility. Baseball captions are available as an option with the PS-6900 model. Available with wireless controls. For more than 30 years Colorado Time Systems has been the system of choice for sports timing and scoring. CTS has a timing system for almost every sport including swimming, basketball, football, baseball, track, soccer and most others. Colorado Time Systems has a wide variety of displays, ranging from fixed-digit scoreboards to animation LED boards to full-color video displays and ribbon boards. It also has high-quality, state-of-the-art displays for indoor or outdoor use. Step into the big leagues with a Spectrum Scoreboard. 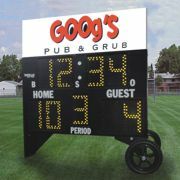 Both durable and dent-resistant, the scoreboards withstand the toughest conditions. This 7-foot-high, 20-foot-wide custom-designed baseball/softball scoreboard features a dynamic two-color mascot with inning-by-inning scores and Runs, Hits and Errors. Team name, customized color combinations and border striping is always included at no additional charge. Score like never before with Sportable Scoreboard's new patent-pending Legacy series. The Legacy series delivers the performance, efficiency and reliability you deserve in a scoring system while at the same time allowing you to discover a whole new game experience. Kick off your season in style with this extraordinary scoreboard shaped like a football helmet/ You will be amazed at the versatility and the level of customization. OES scoreboards are installed worldwide for a variety of sports activities, in a number of venues and custom applications, from schools and sporting clubs to Olympic facilities and NBA venues. OES' proven technology is now used by NHL and NFL teams. From locker room clocks to shot clocks to complete timing and scoring systems, OES design engineers are able to configure scoreboards and timing systems to suit customers' exact requirements. All OES scoreboards feature high-intensity LED digit displays that offer an exceptional viewing angle.